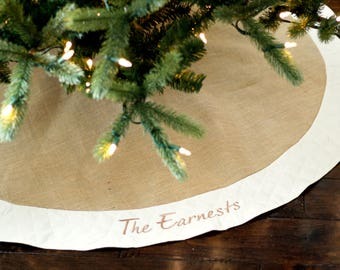 Enter the name Exactly as you want it embroidered. 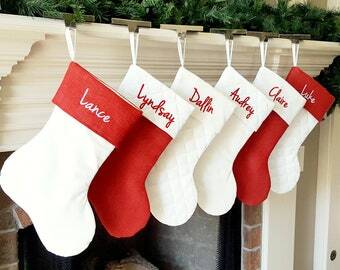 Max 12 characters per stocking. If ordering multiples of same style make sure you select the correct qty above. Separate the names with a new line. Please also add thread color requests if any. Thanks! 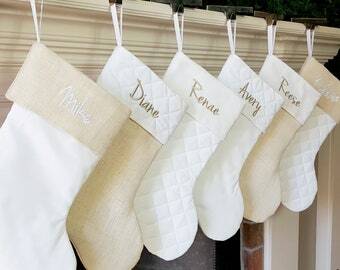 These quilted Christmas stockings are made of high quality materials in a deep red, hunter/forest green and ivory. 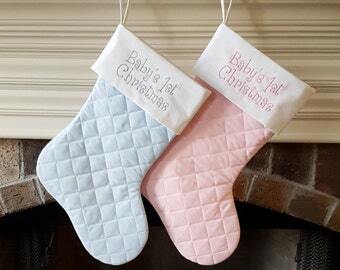 These Christmas stockings are padded and hang beautifully even when empty! They are fully lined and made to last a lifetime. All handmade with a perfectionist's quality. 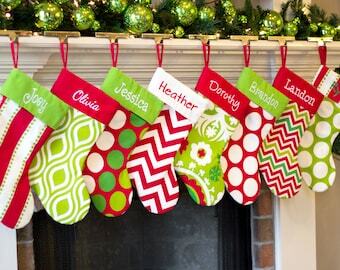 Made from my own pattern these Christmas stockings are the perfect size... not to big and not to small. 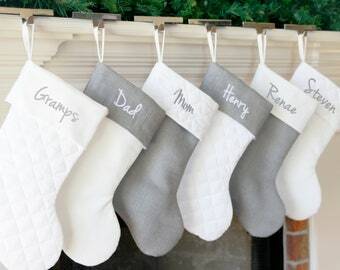 They are slightly larger than most stockings you find in a retail store. The quality is far superior! 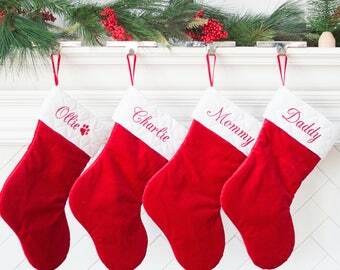 Add one stocking to your cart. Go back to this listing, make another selection, and add it to your cart. If you need it fast please send me a message!!!!! Rush orders can be arranged and are also an option at checkout to ship within 24 hours! Approx. 8.5" wide opening at top. 19" hanging length (not including hanging tab. 22" with hanger). 11.5" Heal to toe. 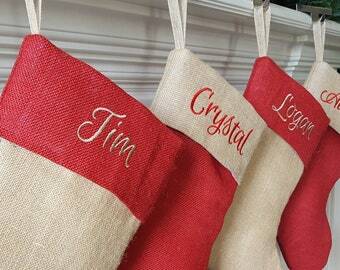 Beautiful stockings that came just as I’d envisioned. 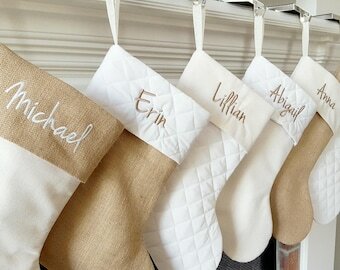 Love this personalized stocking. Shipped incredibly fast and the shop owner is a pleasure to work with! 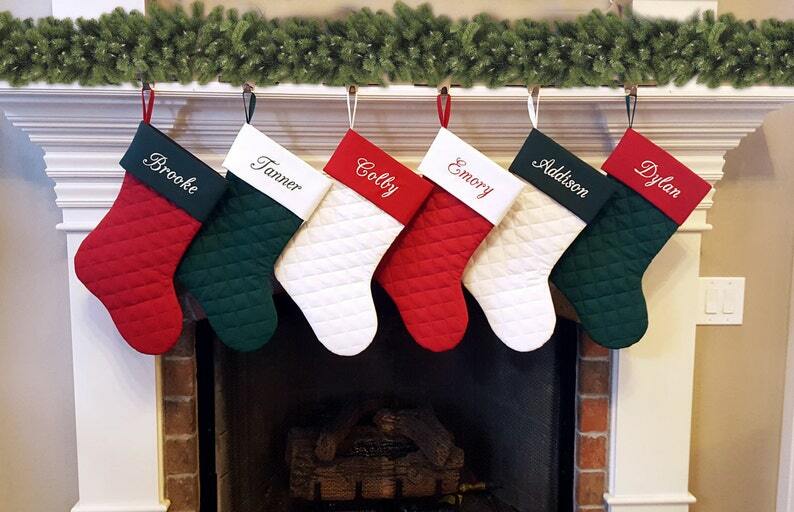 These stockings are beautiful, just as described and expected. Thank you!